A Gluten-Free and Vegetarian take on the classic Vietnamese "sandwich"
Savory, Tangy Spicy and Delish! Before my son had to eat gluten-free I fell in love with a vegetarian tofu Banh Mi sandwich recipe from Cooking Light. It had lemongrass pan seared tofu, pickled carrot, radish and cilantro relish, and spicy Sriracha mayo. 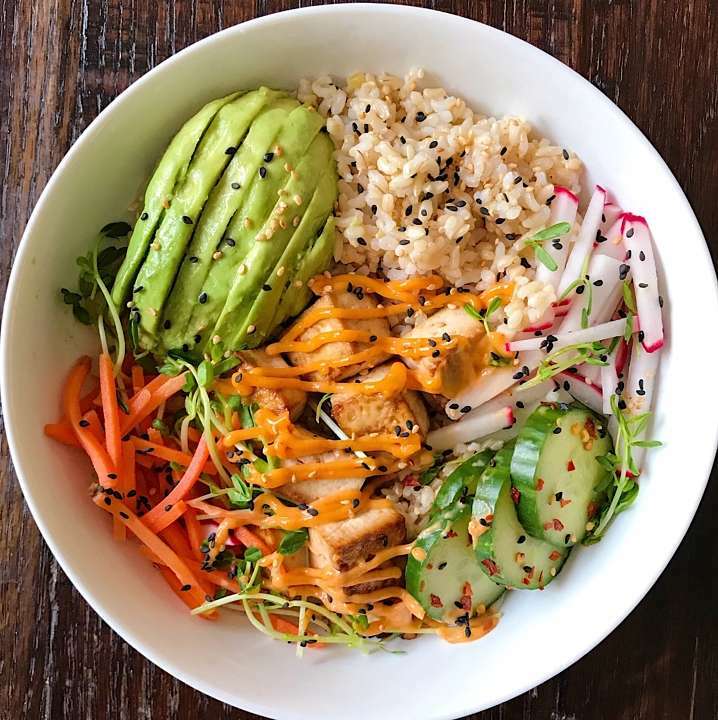 Craving this sandwich, I used the flavors as inspiration for this Buddha bowl with brown rice, lemongrass roasted tofu, pickled carrots and radishes, spicy pickled cucumbers, avocado and of course a Sriracha mayo drizzle. Savory, tangy, spicy, creamy, crunchy— this bowl has it all going on and it is amazing! A gluten-free and vegetarian buddha bowl inspired by the classic Vietnamese sandwich. Savory, tangy, creamy, crunchy and delicious. Recipe inspired by and adapted from Cooking Light. Combined lemongrass, 2 tbsp water, tamari, and 1 tsp sesame oil in bowl. Add tofu and let stand for 15 minutes. Combine vinegar, ¼ cup water, sugar and salt, stirring until dissolved. Add carrots, radish and cucumbers. Let sit for 30 minutes-1 hour. Drain and stir in cilantro. Prepare Mayo: combine remaining 1 tsp oil, mayonnaise and Sriracha in a small bowl and whisk together. Assemble in a big bowl, adding avocado, pea sprouts and sesame seeds. Yum~~ Tried this recipe, but made it my own by substituting daikon for the red radish and left the cucumbers fresh. Fried the tofu as I do not have an oven in my studio apartment. Thanks for sharing! Those are great substitutions! So happy you loved it!